On a crowded debate stage, 10 Republican candidates for president sought breakout moments and tried to avoid missteps that could sink their White House hopes at this early stage. 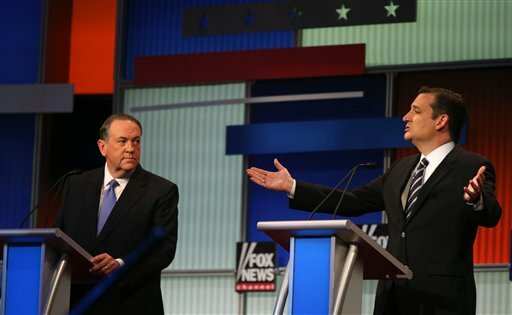 Here’s a look at how they fared during the first Republican debate of the 2016 campaign. Unquestioned star of the show. Set the tone for the raucous two-hour debate by declining to pledge to support the eventual Republican nominee if he’s not the pick. Provided few concrete answers to the policy questions posed during the debate. Used his time to try to introduce himself and his record in Florida to a nationwide audience. Turned boos about his immigration position, which would offer those in the country illegally a path to legal status, into cheers by shifting focus to economic growth. Held firm on the party’s right flank, especially on social issues. His call for recognizing unborn fetuses as persons with full rights ignited applause from the audience. Used humor to make his mark, quipping at one point that he wasn’t sure whether he was going to get to talk again. Conceded his lack of foreign policy credentials, but appealed for the votes of those eager to get new voices in the political arena. Sharp on illegal immigration. Took on his own party’s leadership, slamming the “Washington cartel” that supports “amnesty” for those living in the U.S. illegally. But the accomplished college debater lacked a breakout moment. An aggressor from the start. He was the first candidate to take on Trump after the real estate mogul raised the prospect of a third-party candidacy. His fiery exchange with Chris Christie over government surveillance programs will resonate well with his libertarian supporters. Aggressive, but kept his notoriously hot temper in check. He picked his spots, including a robust defense of New Jersey’s economy. Showed flickers of why he was heavily courted by Republicans for a run in 2012. Buoyed by a home-state crowd. Lifted his national profile by selling an optimistic vision for the country. Defended decision to expand Medicaid in Ohio and earned a rousing round of applause of saying that while he opposes gay marriage, he would support his children if they were gay. Pace contributed to this report from Washington.